Police in Peel Region say two men have been charged in connection with a hit-and-run in a Mississauga parking lot. Two men have been charged in connection with a hit-and-run in a Mississauga mall parking lot that left a 20-year-old man fighting for his life in hospital. Shortly after 12:30 p.m. on Wednesday, Peel Regional Police say three men became involved in some sort of altercation near Ogden and Strathy avenues. The exchange ended and the men went their separate ways but about 30 minutes later, the two suspects spotted the victim in the parking lot of Dixie Outlet Mall near the QEW and Dixie Road. Police allege the trio “revisited their previous altercation” and, at some point, the victim was intentionally mowed down by the suspects in a vehicle. 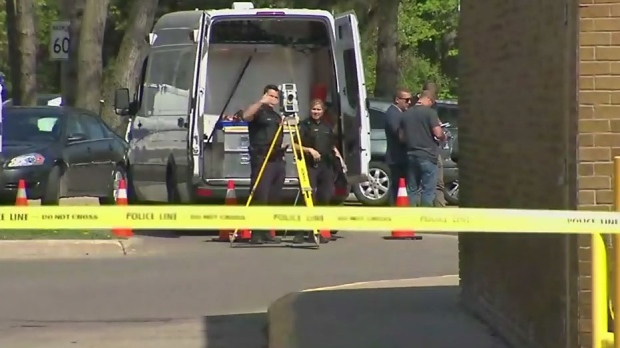 The victim, identified as Orillia resident John Stobbs-Hogarth, was rushed to a Toronto-area hospital where he remains in critical condition. A suspect vehicle was identified shortly after and a picture of the car, a BMW 3-Series sedan, was released to the public. The next day, police say the two males turned themselves in to officers at 12 Division. Suspects identified as 19-year-old Benjamin Steinberg-Harrison and 20-year-old Rohit Rehal have each been charged with one count of attempted murder. They remain in police custody pending a bail hearing on Friday. Police say they’re still trying to determine the series of events that led up to the first altercation, including the actions and whereabouts of both the victim and suspects throughout that day. They’re asking anyone who may have witnessed either incident or anyone who was driving in the area with a vehicle equipped with a dashboard camera to call them or Crime Stoppers anonymously.